This is our first post with iPhone photos. The DSLR is too heavy to carry around and we just happen to have lots of spontaneous dinners here in the city. This time we went to a Hong Kong themed restaurant called Cha Chan Tang (茶餐廳 – Tea restaurant in Chinese). These type of restaurants are everywhere in Hong Kong, specializing inexpensive eats with western-inspired flavors. I make sure to always order the iced milk tea or coffee milk tea every time I go to a tea restaurant. Rather than mixing tea with milk, the HK-style milk tea is made with condensed milk and very strong flavored tea. 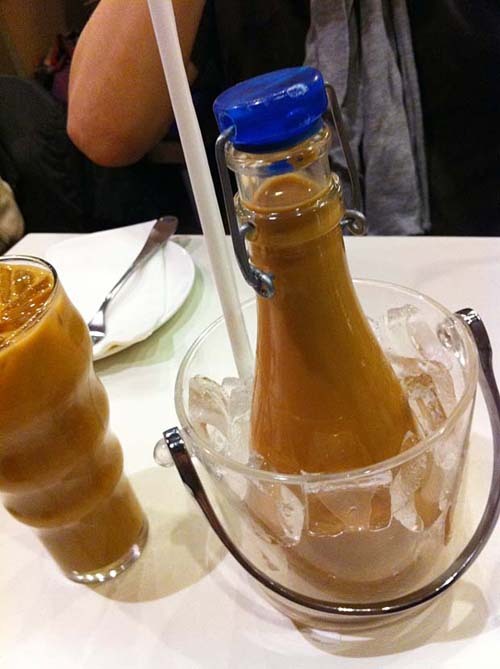 Coffee milk teas are just the combination of coffee, tea, and condensed milk. Another one of my favourites, the pineapple bun. The pineapple bun is covered with a thick layer of crispy, buttery crust on top. Typically people slice the crust with a checker pattern so the crust cracks as the bun bakes, making the final product resemble the outer shell of a pineapple. 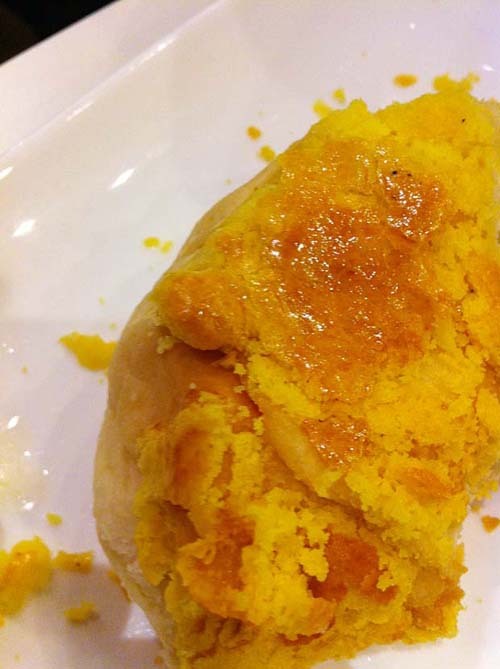 What makes the HK pineapple bun so special is that it is eaten with a thick slice of cold butter sandwiched inside the bun. Sounds scary but it’s absolutely delicious. Instant noodles no longer have to taste boring and artificial, it can also be flavorful when paired with real meat. 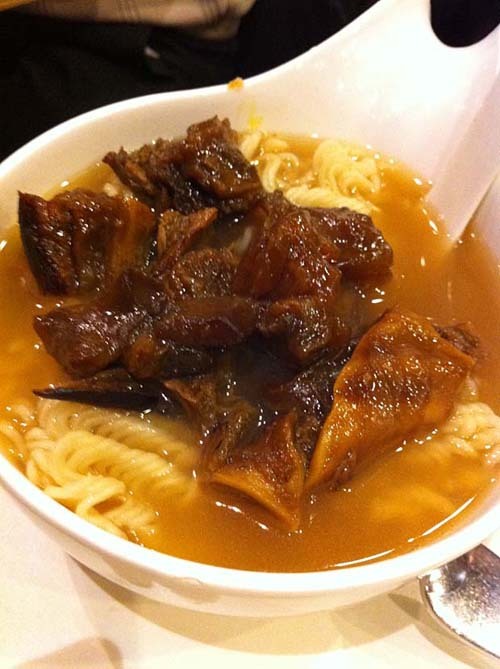 There are a number of combinations, including instant noodles with Spam (luncheon meat), satay meat, and in this case, the braised beef brisket. Well the menus says brisket, but it was mostly tendon. The tendon were better than expected though, cooked through and very tender. 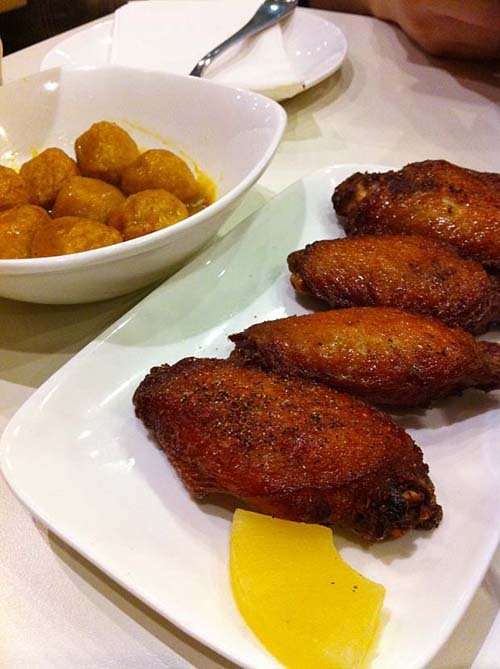 The curry fish balls were pretty good, as were the black pepper sauce chicken wings. I’d love to try a version of the fish balls with Indian-style curry though, I just love the variety of spices and the flavor concentration of Indian curry.